eSolds takes today’s demands for transparency and access to information to new levels with its innovative eCertificates and eSolds Listings. Although originally intended for the Ontario residential environment, the products have wide-scale potential. With interest already ringing in from Vancouver to the East Coast, Wong has secured web domain names for use from the U.S. to China in the hopes the concept will rise to an international level. For a property to be eCertified, a Comparative Market Analysis (CMA) or Letter of Opinion must be provided by a licensed agent. A Home Inspection Report or Status Certificate for condominiums must be provided and a Seller Property Information Statement (SPIS) must be completed. The combined reporting is intended as proof to buyers of the property’s value and condition and should expose any hidden issues. A pre-sale home inspection also identifies any issues that would show up on inspection that can be corrected and documented ahead of the listing process. 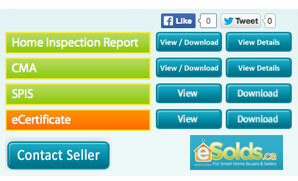 This becomes an asset when considering the numbers of offers revised or rescinded based on home inspection discoveries. Once submitted, documents are reviewed and an eCertificate is issued by eSold staff. “It should eliminate offers conditional on this or that which often hold up the selling process because all of the work has been done up front, documented and verified,” Wong said. The company’s website says the eCertificate is searchable on the website and will remain “for a lifetime” making information available to future buyers and sellers as well as current interests. Wong says staff will also ensure home inspectors are accredited and that SPIS’s have been signed by the home owner. “A details page connected to the certificate will allow users to get downloadable reports including details on who conducted the inspection and their contact details,” he said. eCertificates are intended to help create an educated decision-making process. Wong sees the product as beneficial to consumers but also as a branding tool for real estate agents who will be able to show potential clients the added service feature and the benefits of a more secure and faster sale. He says the eCertificate program goes beyond surface marketing and has the potential to drive homes to the top of listings. The second product is eSolds will provide MLS sold listings within 24 hours so buyers and sellers have real, fair and logical comparables for home values in any given area. “We’re working to add an MLS feed right now to give buyers access to information about any home for sale across the country,” Wong said. The advantage for home owners listing independently is access to data that will help price a home without the help of an agent. One of the top reasons for properties not selling is over-pricing, an issue that can be rectified by access to real information. The same advantage – knowing the real value of property – works for home owners or investors wanting to buy directly from a listing agent or property owner. Before eSolds, that information has not been readily available to the general public. It is also the topic of continued debate. Wong referred to a battle between the Competition Bureau and the Toronto Real Estate Board in which the bureau has tried unsuccessfully to prove the board is engaged in anti-competitive practices. The dispute hinges around sales data, which the bureau wants more freely available online, and to which the board currently limits access. “In the U.S., the market has access to Trulia but in Canada there isn’t any one source for this information, at least not yet,” he said. Access to eSolds are available for different prices for different needs and range from a one-time single MLS listing to unlimited MLS sold listings for a year. Listing information includes market statistics, original list price, sold price and sold date. While Wong says commercial real estate is not his area of expertise and both products would need to be adjusted to reflect the more complex commercial transaction, he sees potential for both in the commercial market. eSolds Inc is a division of GTA-based Search Realty Corp. Brokerage.